Depending upon the offensive formation the Outside Inverts are the first to make their adjustments and come off their “Dog” to cover a receiver or running back to their side “man to man”. Cover “5” is a full “Stunt” with six potential rushers applying pressure to the offensive scheme. Both Sam and Rover are contain rushers and responsible for containing the run to their side and have collapse with ball away. If used with hog goal line, Will becomes adjuster on edge and take over smoke. Look for possible fade if Quarterback reads press coverage by the Corners. Defensive Strength: Cover “5” is a six man rush and is a full six man pressure scheme. Allows Linebackers to roam and mirror schenmes and draws. Defensive Weakness: Possible mismatch with Sam and Rover with # 2 receiver to their side. Cover “7” is known as Quarter / Quarter / Half. This coverage splits the deep coverage into quarters to the callside and half cover to the backside. Linebackers: Play Hook to Curl coverage on pass. Defensive Strength: Good coverage to disguise additional coverages from (show Cover 3) play bump coverage on backside. Openside force and contain becomes a strength, good coverage to defender callside routes. 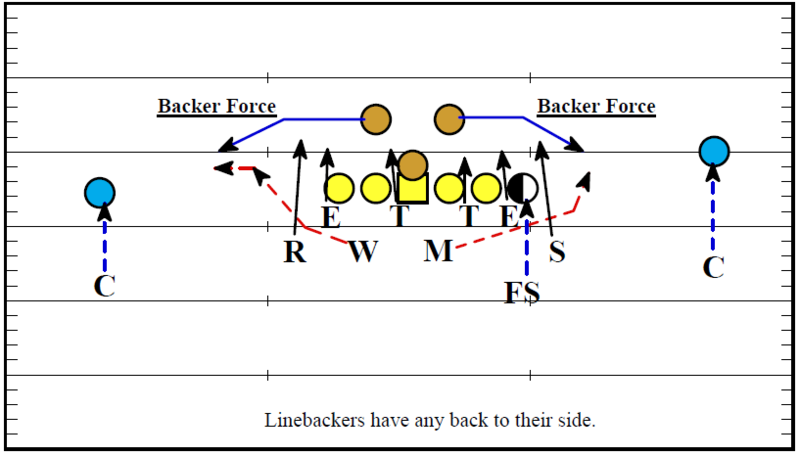 Defensive Weakness: Openside Routes, force Openside, Flood routes backside, and option game backside. Red Zone is that area on the -20 and in. Red Zone puts the defense with their backs to the wall. An offensive goal that most teams have is to score every time inside the Red Zone. 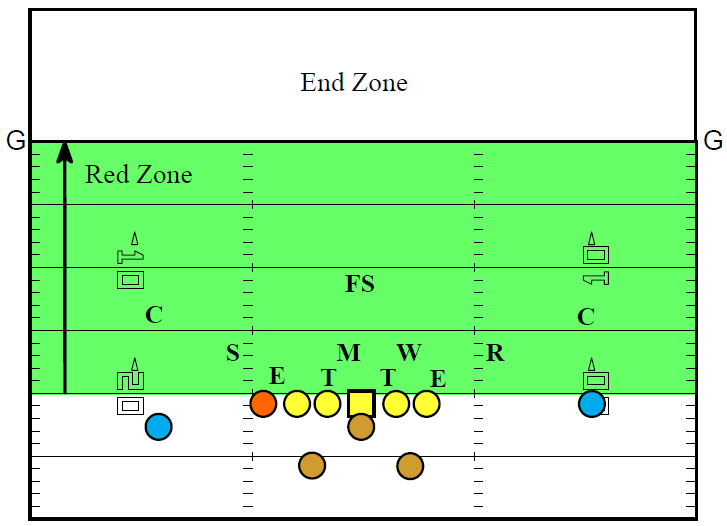 Once a receiver has moved into the Red Zone territory, a defense will slow down their drops in zone or man technique. Philosophy of Red Zone technique is to never allow a receiver to the defender to end zone. If a receiver catches a pass in front of a defender in the end zone, it is a touchdown no matter how hard the defender hits him. The defense wants the ball thrown over the secondary defenders, or thrown like a bullet between the defender and receiver if we are in zone coverage. If the offense has to throw a bullet, it had better be right on target or it’s intercepted. No matter what coverage the defense is in, the defensive philosophy is to “Keep the Receiver Behind Them”. closer the offense gets to the goal line, the vertical field shrinks. The offensive philosophy must change to utilize the space available. The offense must either throw (quick fades, slants, outs) or they must utilize the width of the field with picks and crossing routes. 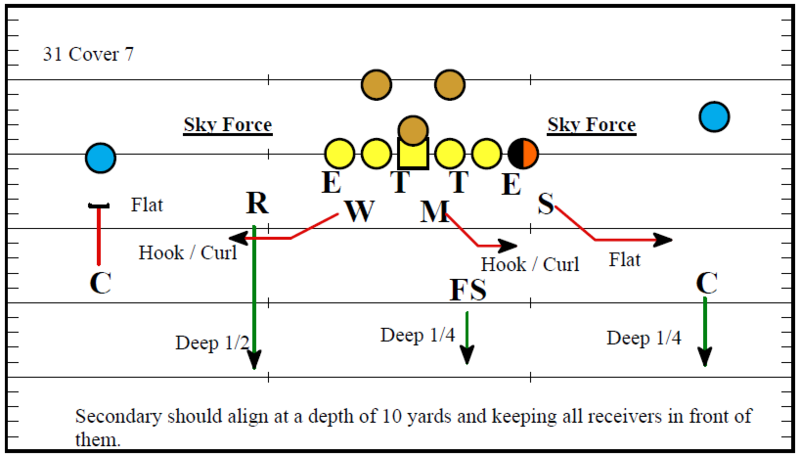 defense must defend the area of the field between the line of scrimmage and receivers.